See what's new in GenScript's popular picks. eBlot L1: Want to increase your transfer efficiency? Achieve complete and even transfers in 9-17 minutes. Try a FREE Demo of our fast wet transfer system. eStain L1: Fast and complete coomassie staining and de-staining in 10 minutes. Try a FREE Demo of our automated protein staining system. Purify large number of protein or antibody samples in hours. Try a FREE Demo. 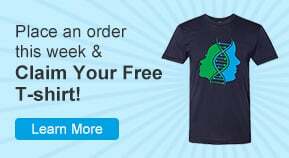 Place an order this week & Claim Your Free T-shirt! Get higher purity peptides at less cost with faster delivery! Guaranteed amount & purity PLUS price match! Promotional pricing starts at $840.